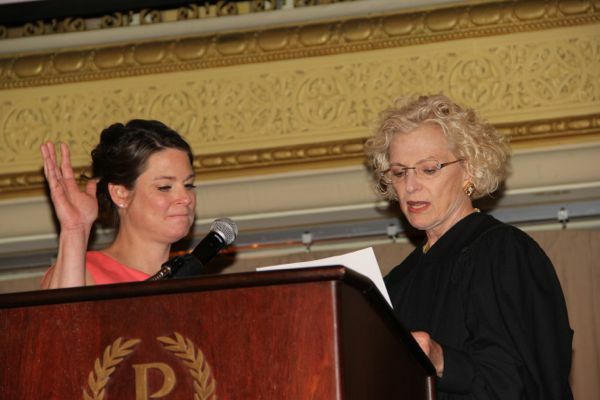 Corboy & Demetrio lawyer Michelle M. Kohut was installed as President of the Women’s Bar Association of Illinois (WBAI), on June 13, 2013 at the statewide bar group’s 99th Annual Installation Dinner and Awards Benefit in Chicago. “I would like the Women’s Bar to truly become the bar association of Illinois. Being a statewide organization is a topic that dates back to our roots,” Kohut told the crowd of more than 800 lawyers, judges and other dignitaries, announcing that Empowerment through Networking is the theme of her presidency. “To connect with other professionals throughout the state is not only good for our membership but also for our individual growth. We become empowered through the associations we make through networking,” Kohut added. Michelle joined Corboy & Demetrio in 2004 and practices in all areas of personal injury law, including cases arising from automobile collisions, medical malpractice, construction negligence, premises liability, product liability and railroad negligence. She has tried many personal injury cases to verdict and has obtained numerous multi-million dollar settlements.